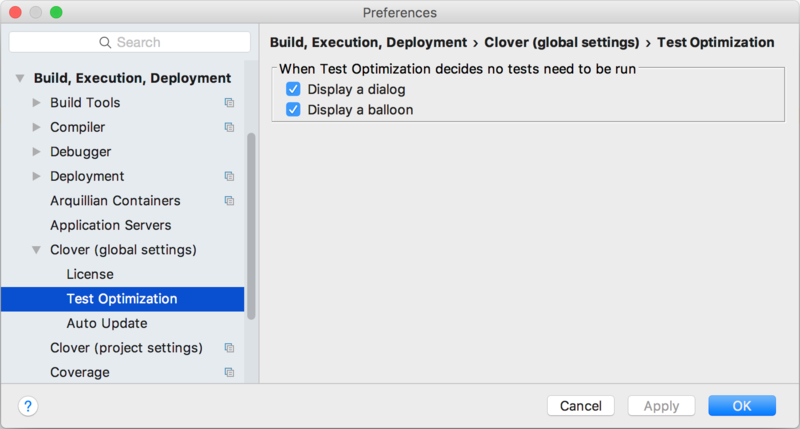 This page explains how to set up Clover's Test Optimization feature in the IDEA development environment. Before using Test Optimization with Clover-for-IDEA, be aware of the following. Test Optimization is available as a 'Run Optimized' command, similar to 'Run' or 'Debug'. 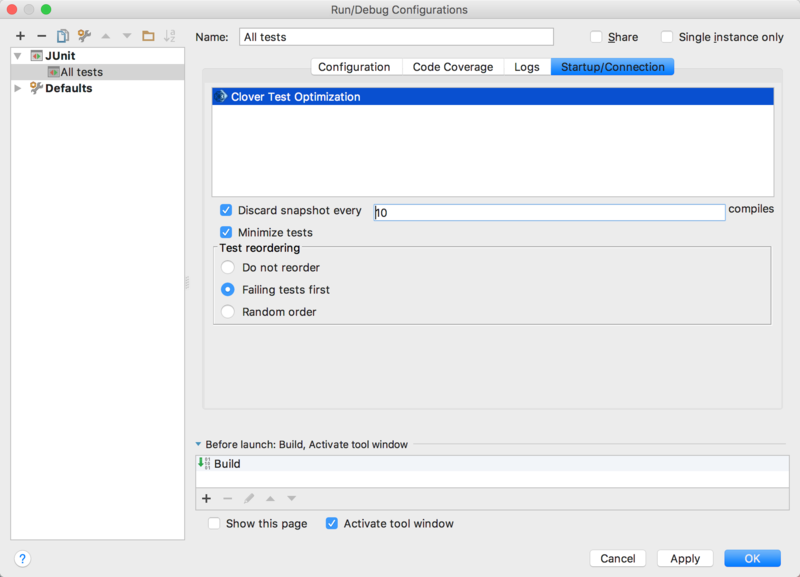 Test Optimization supports JUnit launch configurations only. Ensure you have Clover enabled on the project; when there is no Clover instrumentation, there is no Test Optimization. Select an existing launch configuration in the Run Configurations drop-down menu and press icon. When optimized tests are being run, Clover displays additional information about it. After Optimized tests run, Clover saves a snapshot file with coverage information that is used to optimize the following test runs. This file may be deleted using the Delete Snapshot icon in the Clover tool bar. The Delete Snapshot icon is invisible when the project does not have the snapshot file. Test Optimization would run all tests (no optimization) when the snapshot file is deleted or absent. Open the "Clover (global settings)" page. On this page you can defined how Clover should notify about empty test runs, i.e. ones that have all tests optimised out. Display a balloon: Pops up a notification balloon. Open the "Edit configurations" dialog, select test configuration. Next open the "Startup/Connection" tab and select the "Clover Test Optimization". The list below shows the settings available for Test Optimization for specific JUnit configurations. Discard snapshot every X compiles: When enabled, snapshot is re-generated every X compiles. This is the equivalent of Ant's 'fullrunevery' setting. Failing tests first - re-order tests so that the ones which failed (the last time Optimized Test was run) are run first. The defaults copied to new configurations may be set using Edit Defaults button. Some configurations are not suitable for Test Optimization. Please see the following points for specific details. Clover does not recognise test suites as entities that should be optimised away. As the result test suites are always run (never optimised). If your test launch configuration includes both test suite and the test case (which is probably an incorrect configuration), then the test case would be run twice (normal behaviour) or once (via test suite) when the test case is optimised away. Resolution: Do not include test suites in launch configuration, add test cases directly. For more information, see this JIRA issue: CIJ-249. Due to bug CLOV-1084, in case when you execute optimized run and next add new test method to a class, such class will be always executed in next optimized runs. In order to fix it, you have to delete optimization snapshot (see button in tool bar menu). Ensure that the Clover icons are visible. Check whether Coverage Explorer shows any coverage for the project. 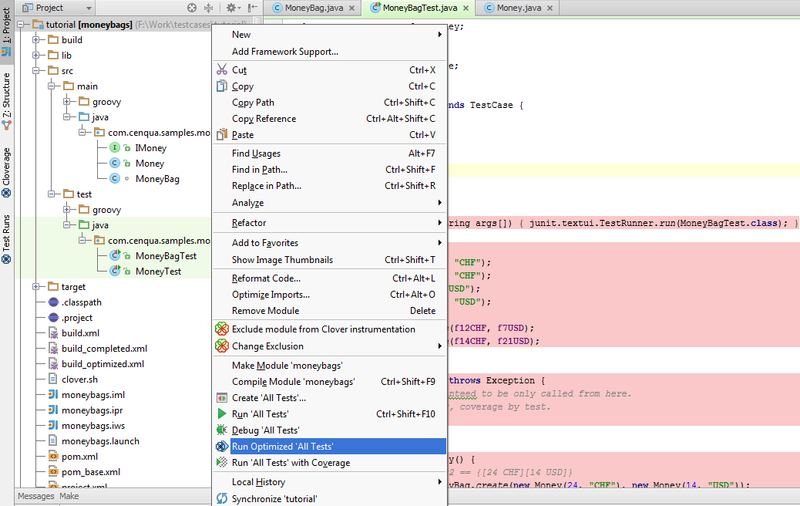 Check whether the Test Runs tool window shows any tests. Ensure that Clover | Compilation | Instrument test source folders option is enabled. Clover does not support test suites. Make sure you don't try to run one, launch test cases directly (CIJ-249). Next chapter: 9. IDEA Advanced topics.